Haven't put anything up in the blog for quite a while. Call it part not having much to put up (unless I put up something other than DIY jerseys or dug up some pics of some old ones), and being either sick, busy, and/or lazy. 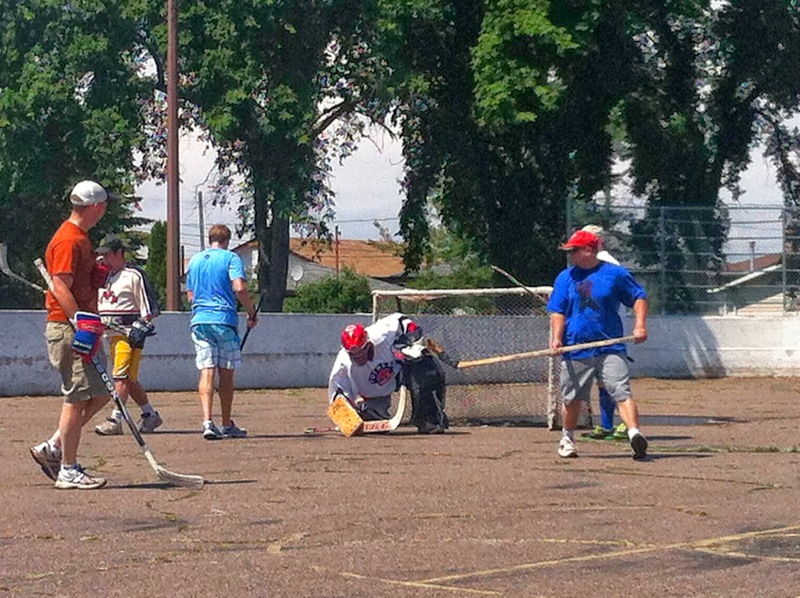 Got some pics of this past summer's annual Ball Hockey game. 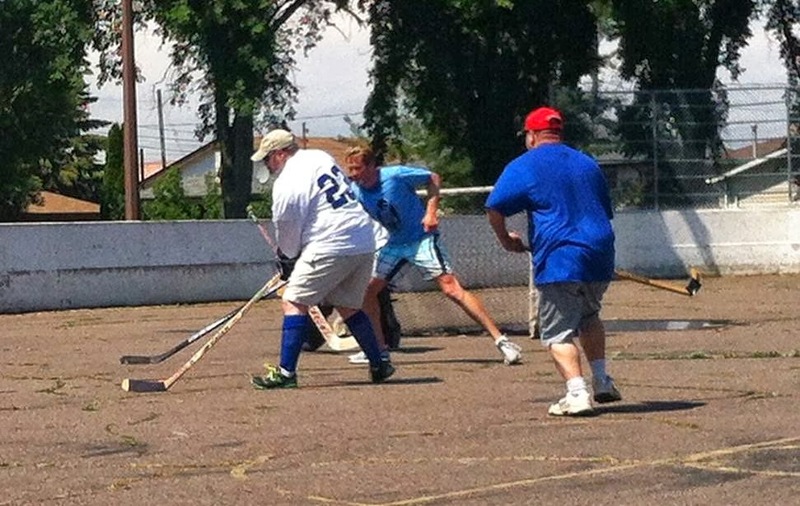 Very humid and hot that day at Charry Park in Thunder Bay. Dave Scott, a man comfortable in goal, was goalie on one side. With no other takers, I put on the pads on the other side either for the first 2 periods or game 1 of 2 (however it went down in the books). 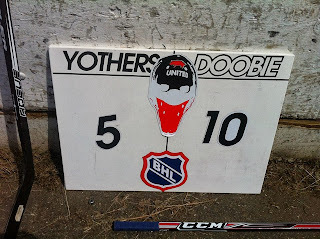 A couple people had to leave after that intermission and a couple more filled in; my wife who doesn't play hockey replaced me in goal played a more stand up style and had a better GAA than I did (I had 10 goals against). I performed a fair bit better when playing out for the last period of the game. Dave Scott had 5 or 6 goals against after the 2nd period; not sure if this pic was taken at end of the 2nd period or a bit earlier. A couple more pics from earlier on in the game. One with a player about to shoot and one that may or may not have been a goal (I think that's the orange ball hockey ball just on top of my pad). There were a couple team pics taken, but at this point it isn't known whose camera was used. I will post them if and when I see them. 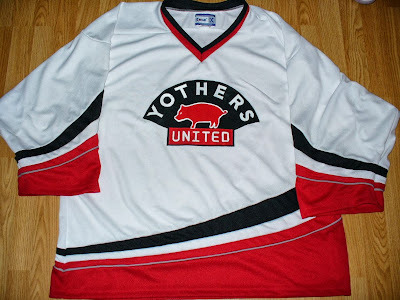 Here's some pics of the Yothers crest I made and put on a jersey for the ball hockey game. On a more recent event. 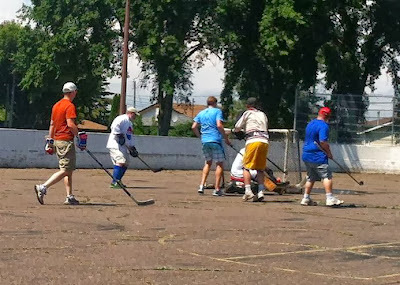 Last week my dad and a bunch of the over 60 guys went down to Duluth to play a couple games in a sort of mini tournament. They played one game against a team from Minneapolis and one from a team from the Duluth area. They lost the first game and won the second one. I'll have to see if any pics were taken. 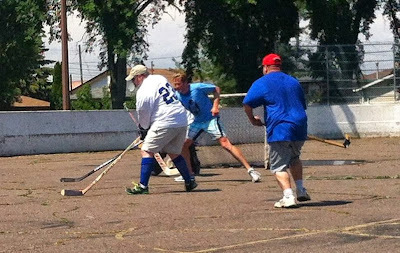 Also, made a rare appearance in goal last Thursday afternoon. Wore the red, black and white striped German eagle jersey (and socks). 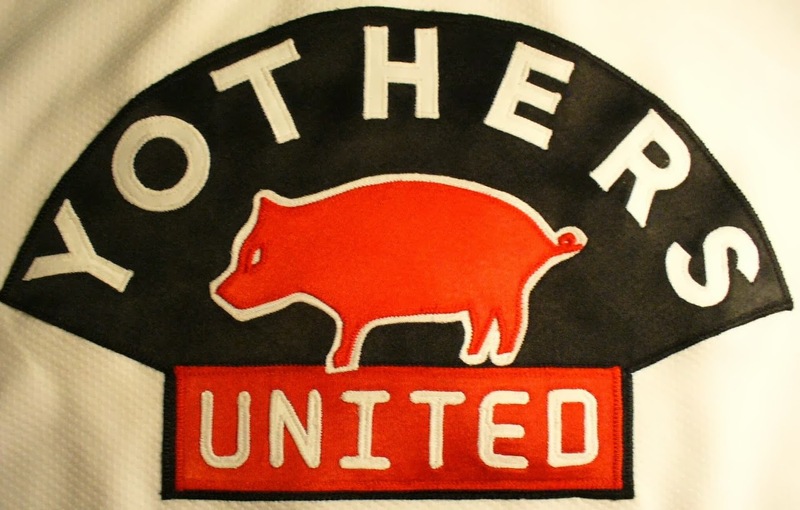 Stunk in up the first 10 minutes and switched from the dark to the white team after five quick goals. 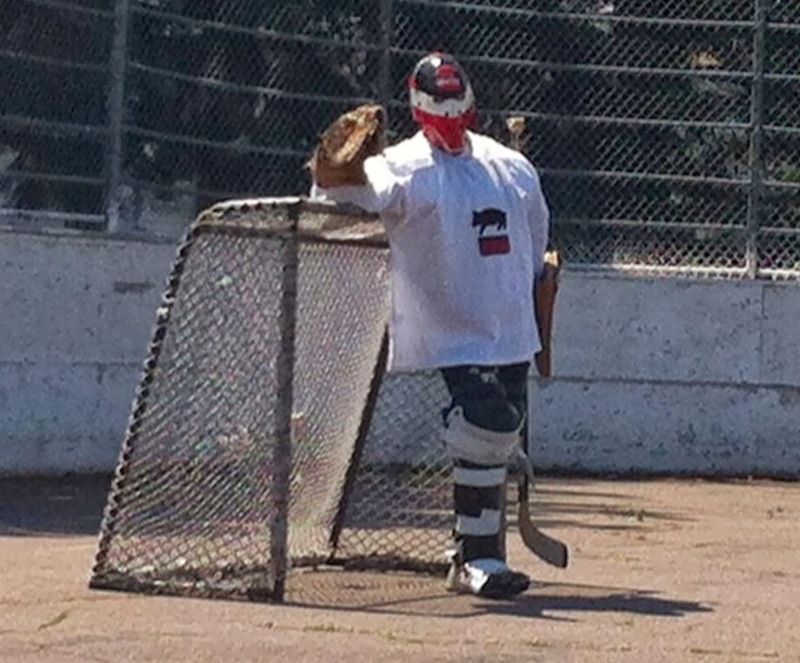 Was a bit shaky at first for the white team but after some lucky saves, the turning point was a left pad kick save followed by a double stacked pad save the other way on the rebound and finished the play with a glove save while still down. 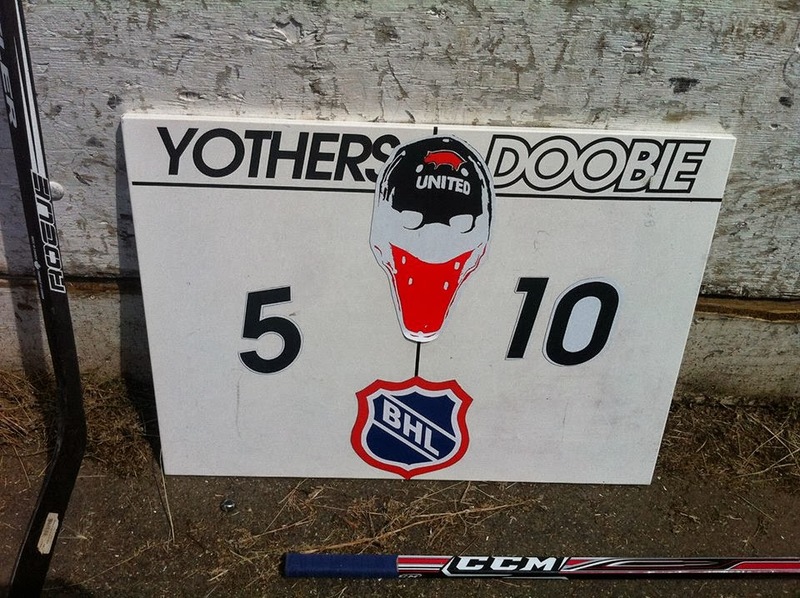 Got my head and body into the game and ended up with a shutout for the white side. 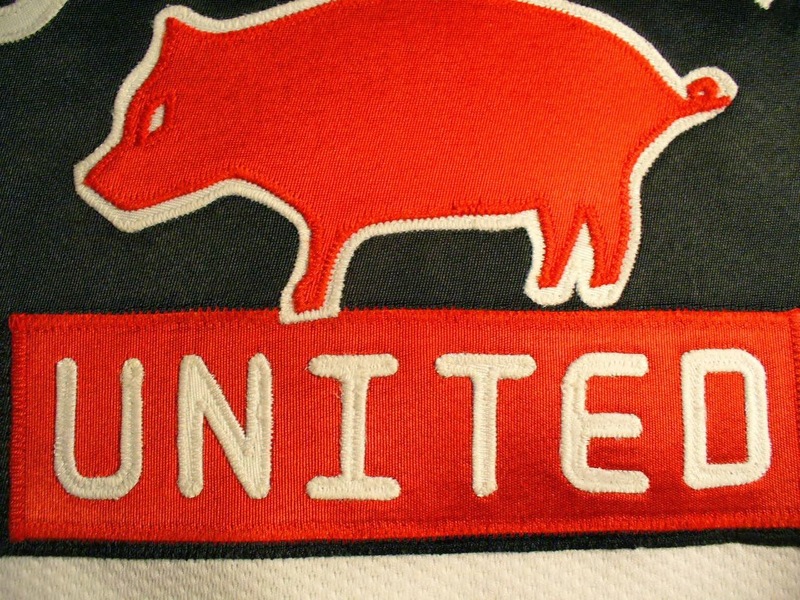 In addition, may have soon have some pics of a jersey I purchased. Jersey is from a hockey television show from a little while back. It should be arriving in the mail this coming week.